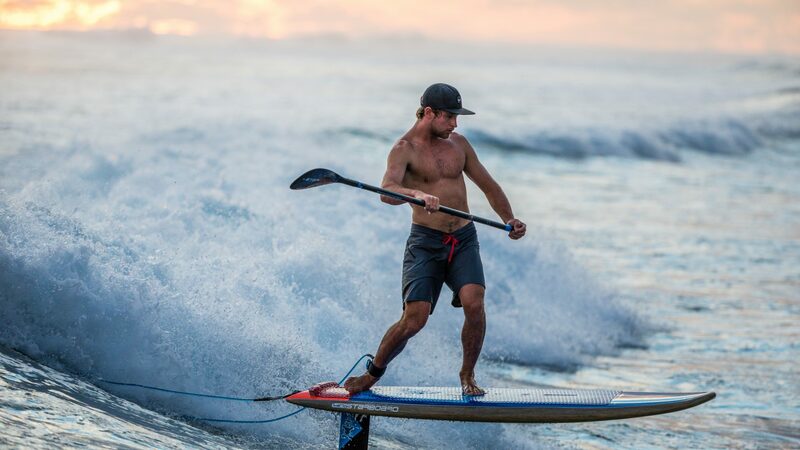 The SUP market grew again in 2018, with the most growth in the mid to low price segment. Even discount- and hardware-store-chains offered cheap SUP sets. Despite these cheap offers, mid to high-end products have been perceived well, too. Starboard clearly will follow the current position as the market leader in innovation and quality, thus offer new technologies for both inflatable and composite boards. The Deluxe drop-stitch is a fusion drop-stitch, which became stronger, stiffer and more durable as before. For 2019 not only deck and bottom are made infusion technology, but also the rails are welded on all inflatables. All Composite boards are produced with bio-resin and offer a wide range of sustainable technologies, like Flax-Balsa. As a premium brand, we see our responsibility to care of our planet, thus our co-workers, eco-teams and eco partners helped us develop a series of programs to become carbon net positive. Then we worked on making up for past emissions and also further plan on becoming 10x net positive. Reducing our carbon and plastic footprint for a healthier planet starts with the products we make. Eco-innovations emerge from scrutinising all our products, materials, accessories, inserts and packaging in search of high performance with lower impact on the environment. Of course, the majority of boards sold are inflatable boards. Nevertheless, we continue to develop composite boards to achieve the best level of performance, thus are able to provide the more sophisticated rider with the best equipment available. Now the new 2019 Blue Carbon boards have achieved a level of performance and sustainability un-preceded in our industry. It’s the first ever Gold level ECO SUP board and our World Champions swear by them with their class act performance. The only black carbon remaining is a UD 80 strip in the rail area with the highest overall total failure potential, continuing our Zero breakage voyage by utilising other better-suited materials where basic impact resistance is vital. Glue is never forever. Starboard’s new welding technique turns two into one– using heat to bond two separate pieces of PVC into a single solid unit. Heat-welded PVC creates a mechanical bond that’s stronger, lasts longer – and is better for the environment. Starboard won the SUP Racer constructors world title many years in a row, by offering three different types of Race boards. With Sprint, Allstar and ACE we cover the whole range from flat-water to open ocean conditions. Various sizes and length accommodate all rider weights and sizes as well as all race formats. With a full range of foils for SUP, Surf, Windsurf and Kite, Starboard continues to prove leadership in this new category as well. With the Hypernuts 4in1, you can go SUPing and Windsurfing, as well as putting a foil in and start to fly.